There are now 30 times more white people than African-Caribbean people on the bone marrow register, blood cancer charity Anthony Nolan has revealed today . This is causing black people with leukaemia to miss out on their only chance of survival, as only 20 per cent of them will find a perfect match. Today, new research suggests the lack of black people who are willing to donate their stem cells (or bone marrow) may be due to poor awareness, combined with the integral role that family networks play within African-Caribbean cultures, according to a YouGov survey commissioned by Anthony Nolan. 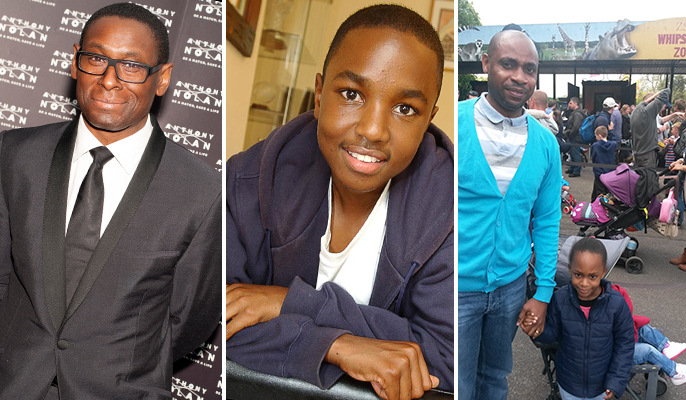 The charity is today launching a campaign together with the African-Caribbean Leukaemia Trust (ACLT) to boost the numbers of black donors, backed by celebrities including David Harewood MBE, Richard Blackwood and Wretch 32. Nearly one in ten black respondents (8%) said their family wouldn’t approve of donating stem cells – compared to just 1% of the total population , and 12% of black people also viewed donating stem cells as a ‘dangerous activity’, the highest of any ethnicity. Currently, there are around 550,000 people on the Anthony Nolan register but only 2.8% of these people are African-Caribbean. Anderson Hall, 40, from Luton, was faced with misconceptions and distrust within his community, when he told people he was donating his stem cells to save the life of a child overseas after signing up at an ACLT donor drive. “When I told people in my community what I was doing, I found that a lot of people didn’t know anything about it and they were very apprehensive,” said Anderson, who donated stem cells in December 2013. “I definitively got a mixed reaction, particularly from the older generation - but there was also a lack of knowledge even in the younger generation, which surprised me. People kept telling me not to do it or to not get involved with these things. They were worried about the kind of side effects it could have and how it could have a detrimental effect on my health. Overall, black people are around three times less likely than white people to find a donor who is a perfect match.Ann O’Leary from Anthony Nolan has warned of the life-threatening inequalities faced by black people waiting for a donor. “It is heartbreaking that African-Caribbean people may be literally dying, not because a matching donor for them isn’t out there somewhere – but because that person never joined the register,” said Ann. “The closer the tissue match, the better the chances for the patient, and you’re most likely to find your match from someone in the same ethnic group. Because there are tens of thousands of different tissue types out there, it means the odds are stacked against you if you’re African-Caribbean, as the pool of potential donors is so much smaller. To join the register you must be between 16 and 30, and you will remain on the register until you are 60.